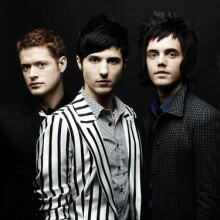 Songfacts reports that Nashville pop rock band Hot Chelle Rae began with a meeting between singer-songwriter Nash Overstreet and guitarist Ryan Follese in 2005. After several changes, they eventually finalised their line up as Follese (lead vocalist), Overstreet (lead guitarist) plus Ian Keaggy (bass) and Jamie Follese (drums) and named themselves after their first "dedicated" fan, Chelle Rae. They were signed to Jive Records in October 2008, and then began work on their first album, Lovesick Electric, which was released on October 23, 2009. Songfacts reports that Nashville pop rock band Hot Chelle Rae began with a meeting between singer-songwriter Nash Overstreet and guitarist Ryan Follese in 2005. After several changes, they eventually finalised their line up as Follese (lead vocalist), Overstreet (lead guitarist) plus Ian Keaggy (bass) and Jamie Follese (drums) and named themselves after their first "dedicated" fan, Chelle Rae. They were signed to Jive Records in October 2008, and then began work on their first album, Lovesick Electric, which was released on October 23, 2009. Tonight Tonight became their first song to enter the Hot 100 when it debuted at #93 on the chart dated April 30, 2011. Their song, I Like To Dance, being featured on the show "So You Think You Can Dance," was their first released single. Darling readers if you are reading this, you are on on the page of the recording artist hot chelle rae in our eLyricsWorld. Our database comprises with data about 52389 artists worldwide as well as 829824 songs 43 of which are from hot chelle rae. Besides the singer's biography, on this page you can see brief information about them, enlists birthdate, genre, label Be conversant with all the facts around hot chelle rae by adding RSS feed. If you prefer you could directly visit the address you are on at the moment and check out what's new and latest songs about the artist.